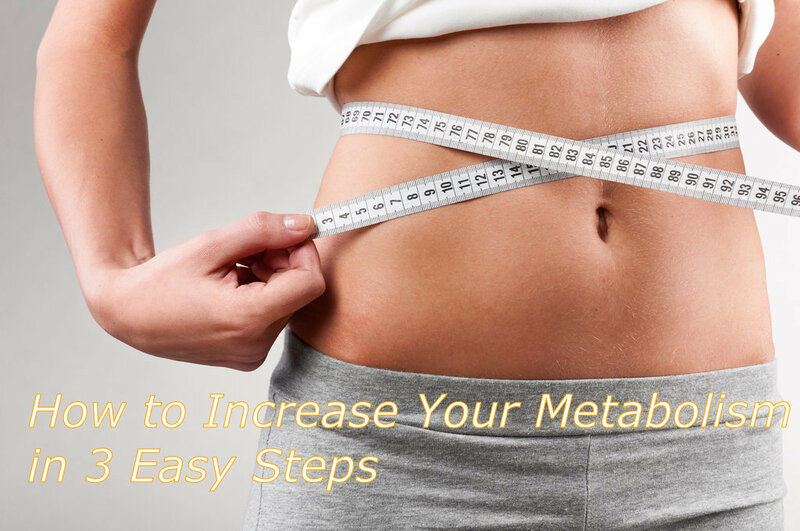 Want to learn how to increase your metabolism? Lets face it, there is no magic bullet to weight loss, or one single way to increase your metabolism. It is a a bunch of really small changes that are easy to do and easy not to do. But over time they have a compound effect that shapes how you look and feel in the days ahead. So let’s make some changes. They don’t have to be as complex as algebra equations or as physically demanding as climbing Mount Everest. Let me show you how to increase your metabolism in 3 easy steps that you can start today! I am sure you have heard it a hundred times. From that over the top gym teacher in high school, maybe a family member, or perhaps you read an article similar to this. Yet so often I see people going into the gym who maybe have never made such an effort before, release a floodgate of bent up physical aggression and then wear themselves out. Lets not do that. If this is your first time taking a serious commitment to exercise lets learn to crawl before we walk. First thing I would get out of the way is to get that body in motion. If you don’t already have a regular workout routine, try walking. If you did nothing more than that 3 times a week you could reverse 50% of the inevitable metabolism slowdown that comes with age. Not bad for only putting one foot in front of the other huh? This is what many consider a Low Intensity Steady State or LISS training. Very effective in burning fat with low muscle loss. Maybe you are already past walking and you incorporate something similar in your daily routine. Perhaps you walk to and from work. So now lets kick it up a notch. Incorporating Yoga is a wonderful, non-impact way to gain flexibility and strength. And by non-impact I mean that you are going easy on your joints. Anyone with bad knees or achy back, this is a wonderful place to start. It is also a great way to release cortisol which is the stress hormone that slows down Metabolism. Now for those of you looking to take it to the next level I suggest Interval Training, or HIIT (High Intesity Interval Training). At Tiger we have wonderful Bodyfit and CrossFit Classes that are key for increasing endurance and strength. You may have heard that the more muscle you have the easier it is to burn fat. This is why we always point to the individuals with more muscle and call it good genetics. Not always the case. You show up and put in the effort and you will see the changes occur in your own body. The most easy and straightforward way to put is this IF IT COMES WITH A LABEL AVOID IT AS BEST YOU CAN. Or at least learn what is one the label. Half of the stuff that is on there is hard enough to make into a sentence let alone know what effect it is going to have on your body. Protein is key. We don’t have to get into any mixed conversation about how you consume your protein. Some prefer plant, others prefer animal. But I think we can all agree that protein is an important component to every cell in your body. It helps build and repair tissue which lends to increase in muscle and decrease in fat. So make sure that with each meal you are a getting a good portion of protein. Carbohydrates are not all equal. I think we all know that when we look at the difference between a plate of fruits and veggies vs a plate of cookies and candies. Carbohydrates are great for providing energy, preventing disease, and controlling weight. So make sure your fridge is stocked up with lots of healthy greens and ditch the low carb nonsense. Which actually leads me to the next section on eating right, crash diets. Please, don’t be suckered into these. In fact, avoid the word diet all together. You can’t out train a bad diet so why would you take a break from a bad diet only to return. Make healthy lifestyle choices that will become habits for you in the future. I am not negating that some of these “dr approved” crash diets are effective and beneficial. But what happens after your 7th, 14th, or 30th day, you go right back into your old habits. Make better choices. Rosemary, turmeric, ginger and basil are powerful anti-inflammatories. Garlic, mustard seed, hawthorne, and chicory are excellent for the heart. But we are talking about the Metabolism and when that is concerned only one spice is king in my book, Cayenne Pepper. If you are like me, spicy foods might not be your thing. I for one need a full glass of water with every hot wing. That being said you don’t need a ton of Cayenne Pepper for it to work its magic. Sure it heats up your food but it also heats up your body which is wonderful for a thermogenic effect. To name a few of the incredible things it will do, it reduces LDL blood cholesterol, triglyceride levels, and decreases the formation of harmful blood clots, all of which prevent heart attacks and strokes. It also has awesome anti-inflammatory effects which can reduce everything from muscle soreness to headaches. Try adding this spice to your morning breakfast.